With lots of sun about, but a nip in the air, it was time for some winter sewing. I bought the Jade skirt pattern at the same time as I bought the Jasper sweater pattern and have been waiting for some cooler weather to make it. This is a lovely skirt for the cold weather as it's fully lined and figure-hugging, so very warm and cosy. The front is folded in a zig-zag pattern and the back is plain. After making this, I have much admiration for Lisa of Paprika patterns as it must have been a very difficult pattern to create. She has done a fantastic job of getting the sizing, instructions and drafting spot on. It is very well thought out and even has a completely clean finish on the inside. The folds are the trickiest part, but as long as you keep your wits about you and use many pins to keep everything in place, it's quite straightforward. Each fold is held in place by a line of stitching and it helps to pin the fold back and pin all around the area to be stitched so nothing moves. Once the front is done, it's plain sailing to make this skirt. There are two options for length. I made the longer version and omitted the back exposed zip. This skirt just pulls on and is perfect for accommodating large lunches. I used a thick, two-way stretch fabric, like ponte but probably stretchier. I used thin black knit fabric for the lining to reduce bulk. I made a straight size 4 and reduced the seam allowance slightly towards the hemline so it wasn't quite so tight. I wore this skirt out for coffee with friends this morning and felt warm, comfy and a little bit chic! 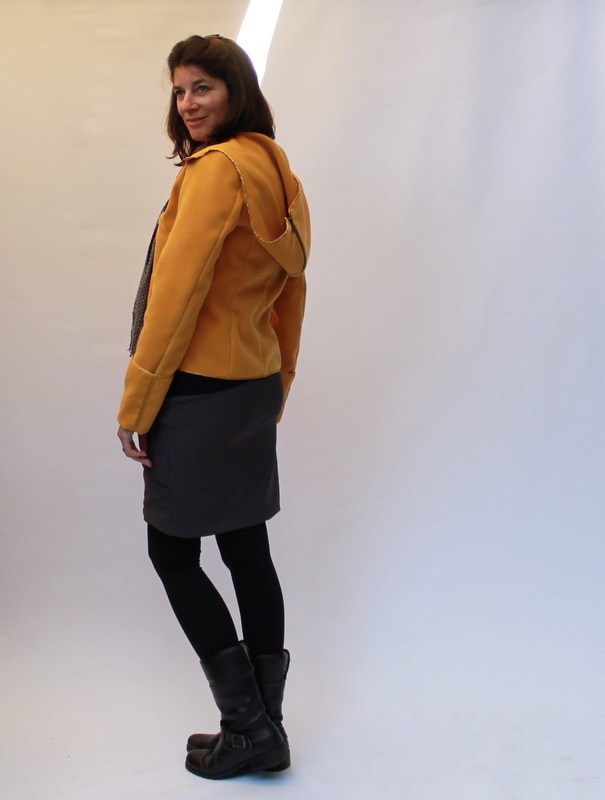 The jacket is Burdastyle 12/2012 #139, made last year. Interesting skirt & I like your entire outfit. Thank you. I think the skirt will go with lots of things. You do look chic! I love the outfit, and the skirt front folds are an interesting detail without screaming "look at me". You have put your finger on it. Thank you! Beautiful skirt Megan. Love the folded detail. Love how you have styled it with your mustard jacket. Very chic outfit. Thank you. I think I'll be wearing this one a lot! Meg, the skirt looks great and so do you. Have you lost weight? I agree with Jean Margaret, that jacket rocks. Thank you gorgeous! No weight loss, just poor lighting! That is such a "me" outfit! I love your new skirt. It is both interesting and comfortable looking. Thank you so much. I think this skirt would definitely suit you! This is very cute! I just taped this together and must create it! Thanks for the helpful review! Oh no, another pattern I absolutely have to have. I love this skirt! And their hoodie pattern is pretty fabulous too. I didn't post a comment on this skirt, and I don't know why because it is fabulous and it looks amazing on you! I have added it to my list of makes and have loads of fabric that might just be suitable.